Below is a list of redox systems we have created. 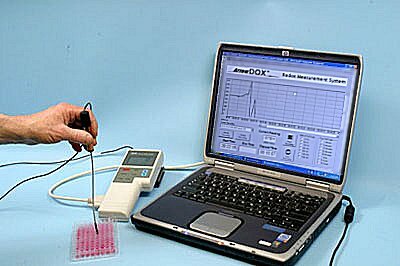 Our most popular system is the ArrowDox MicroRedox Measurement System but we also have other redox systems such as standard size redox measurement, redox in NMR tubes and more. To receive further information on any of our redox measurement systems, fill in the form on the bottom of this page. System includes micro redox electrode for measurement of your smallest samples. System includes micro redox electrode with extra long cable for NMR tubes for measurement of samples inside your longest NMR tubes. System includes micro flow through redox electrode for flow through measurement of redox in small samples. System includes standard-size multi-purpose polymer body redox combination electrode for measurement of redox in various sample types. Other pH or redox electrodes may be substituted for the standard electrodes included. Contact us using form below for details and pricing.